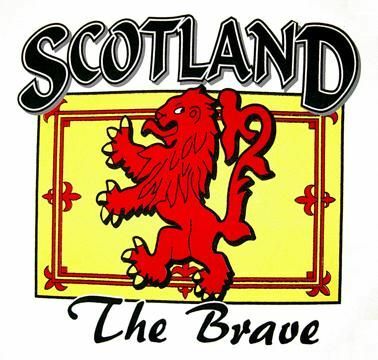 "Scotland the Brave" (Scottish Gaelic: "Alba an àigh" with àigh meaning joy, happiness, prosperity, luck, success - lots of good things, but not brave or bravery) is a Scottish patriotic song. 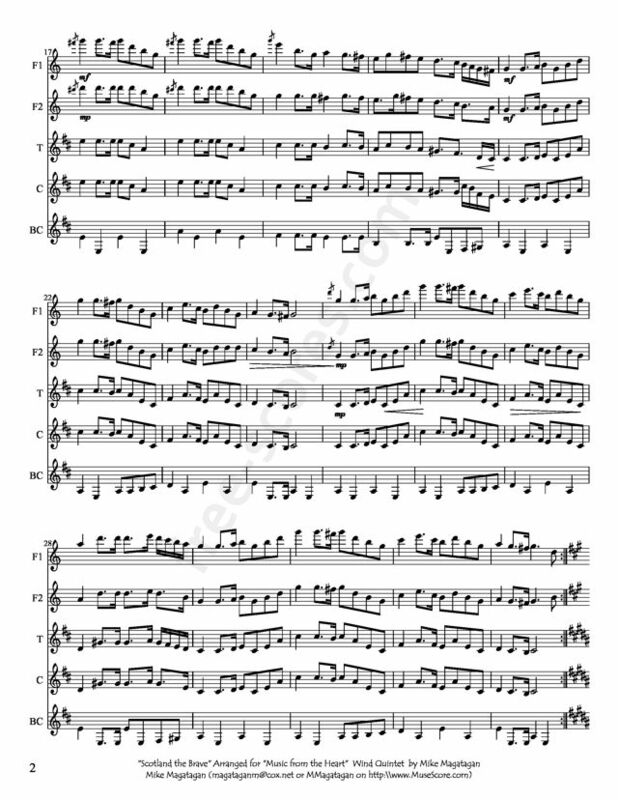 It was one of several songs considered an unofficial national anthem of Scotland. Surprisingly, Scotland has no national anthem, although along with "Flower Of Scotland", the Gaelic Air "Alba An Aigh" rendered in English as "Scotland The Brave" is as good as. Written in 2/4 time, it is of surprisingly recent origin, and was published first around 1911 as "Scotland, The Brave!!! ", and has been dated from around 1891-95, although the sentiment dates back to at least the 1820s. 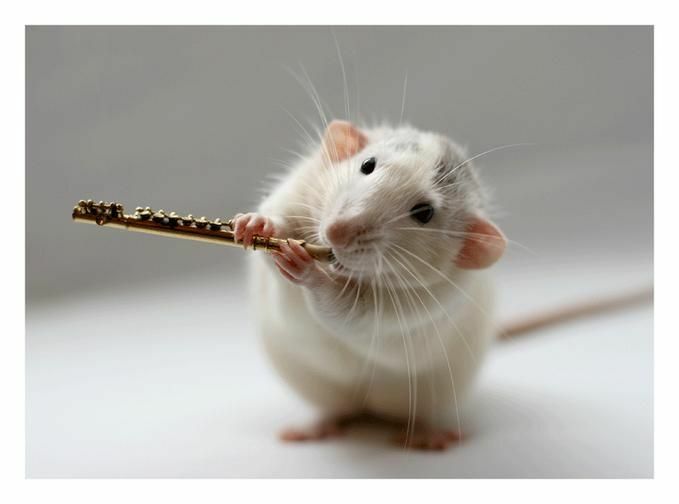 It was probably originally a flute solo, though the instrumental version is more usually played on the bagpipes. The definitive lyrics were penned as recently as 1951. Glasgow man Cliff Hanley (1923-99) was an author, historian and broadcaster among his other talents; he wrote the new words for Robert Wilson, a performer who needed a song for the finale of his show at a Christmas Scottish review that was being performed at the Glasgow Empire Theatre. "Scotland The Brave" is also known as "Brave Scotland", "My Bonnie Lass", My Bonnie Lassie" (with alternative lyrics) and as "Scotland Forever". "My Bonnie Lassie" was actually penned by two American songwriters Roy C. Bennett and Sid Tepper (who wrote songs for Elvis). The instrumental version is also the authorised pipe band march of the British Columbia Dragoons of the Canadian Forces. In 2006, it was adopted as the regimental quick march of the Royal Regiment of Scotland. In content, lyrically, it is similar to "Land Of My Fathers" and similar national anthems and patriotic songs, extolling the natural beauty of the country as well as the bravery of its warriors. 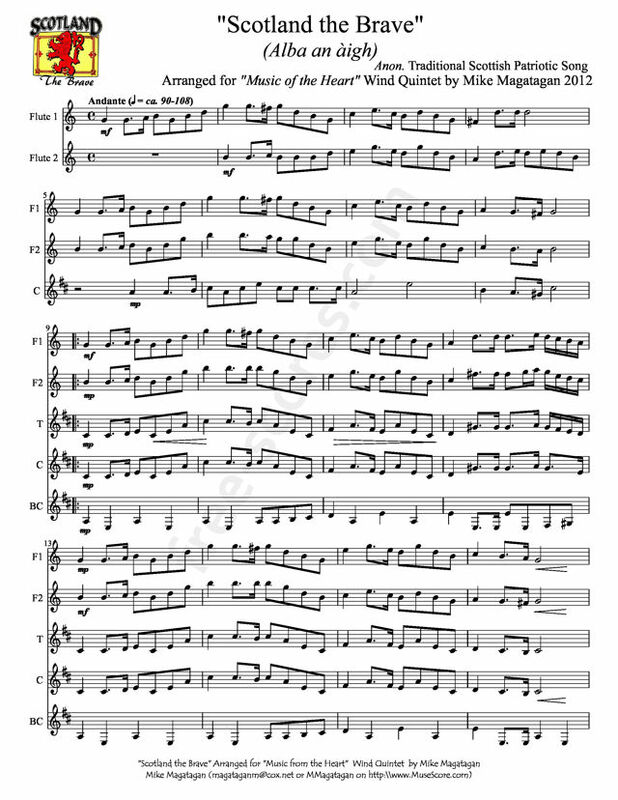 This piece is hands-down, the most popular song for pipe bands to play in American parades. 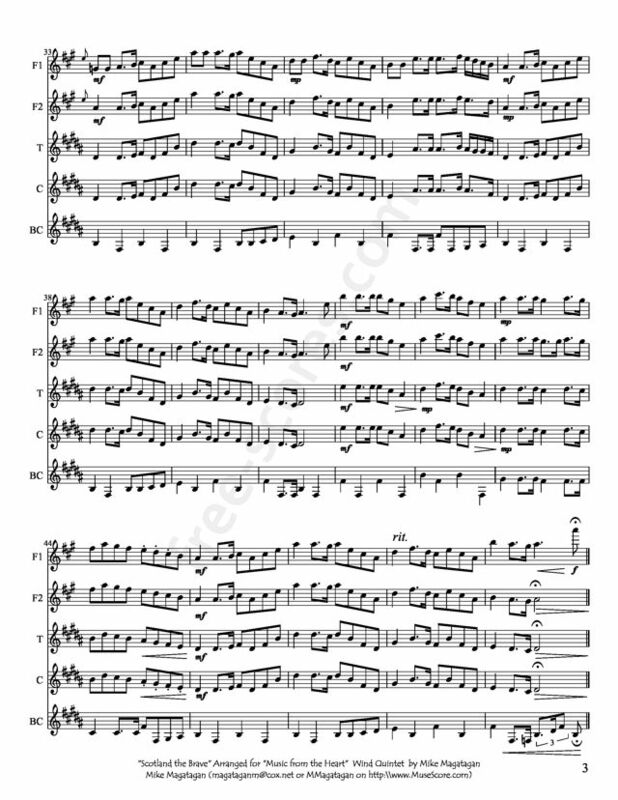 Although this piece was originally written for Scottish Pipe bands, I arranged it especially for the Physicians of "Music of the Heart" (http://www.hfmhealth.org/musicfromtheheart) Wind Quintet (2 Flutes, Bb Clarinet, Trumpet & Bass Clarinet).